The indigenous Batwa people are continuously being marginalized and silenced, which has rendered them one of Central Africa’s most vulnerable and endangered groups. Traditionally a hunter-gatherer society, some of the Batwa still practice ancient traditions and customs, which form part of their rich culture. However, in Uganda just as much as in Rwanda, Burundi and Eastern DRC, the community’s livelihood systems and their survival as a whole is in grave danger due to land grabbing committed by the respective governments. A man, Kihanga, had three sons named Katutsi, Kahutu and Katwa. One day he called his three sons and gave each of them a gourd full of milk. On the next day, in the early morning, he asked them to give him back the gourds for him to place inside a shrine. Katutsi brought back his gourd and it was still full of milk; Kahutu’s receptacle was only half full while Katwa’s container was completely empty. He had drunk all the milk in the night. Their father then blessed each of his three sons based on how responsible they had been with the gourds of milk. Katutsi was blessed with all his father’s cows which would help him and his children to prosper for generations. Kahutu was blessed with a hoe and seeds which would help him to grow food in his lifetime and for generations to come after him. Katwa was given the forest and all that was in it; he was to survive by hunting and gathering. Many generations passed and their descendants multiplied. The descendants of Katutsi and Kahutu became so many that they could no longer be satisfied with what they had and ended up encroaching on Katwa’s forest. In the end, they chased Katwa’s descendants from the forest and made them live as beggars and landless people. The fate of Katwa’s descendants in the legend mirrors their situation in real life. In 1991, the Batwa in Uganda were evicted from the forests they had lived on since time immemorial. As a result, most were left landless and impoverished and, to survive, resorted to begging and life as labourers on other people’s land. As in the legend, originally the Batwa were forest dwelling hunter-gatherers, living and practising their cultural and economic way of life in the high mountainous forest areas around Lake Kivu in Rwanda and Lake Edward in the Great Lakes region of Central Africa; today, the Batwa way of life, their cultural, spiritual, and social traditions, are at risk. The Batwa are widely accepted as the first inhabitants of the region, later joined by farmers and pastoralists. The Batwa are still to be found living in Rwanda, Burundi, Uganda and eastern Democratic Republic of Congo, with an estimated total population of 86,000 to 112,000. As their traditional forested territories were destroyed by agriculturalists and pastoralists or gazetted as nature conservation areas, the Batwa were forced to abandon their traditional lifestyle based on hunting and gathering. The Batwa, sometimes derisively to as Pygmies, became squatters living on the edges of society; some were able to develop new means of survival as potters, dancers and entertainers. The dominant ethnic groups in the region, the Bakiga and Bafumbira, perceive them as uncivilised because of their former hunter-gatherer lifestyle which has led to their discrimination and marginalisation from the mainstream economy. 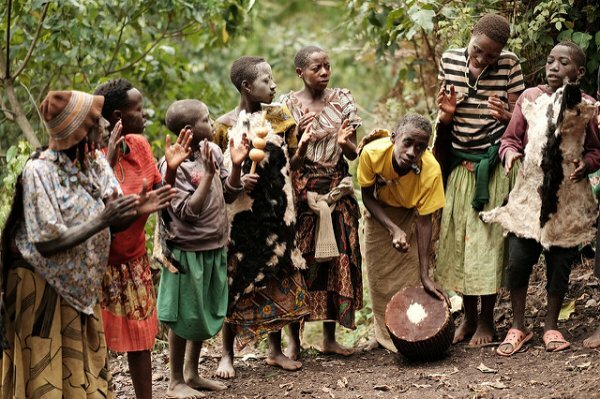 Notwithstanding the numerous problems faced by the Batwa, they continue to value their forest based social system, culture, and traditional practices as an important part of their identity. This existence on the margins continues to this day. For instance, their customary rights to land have not been recognised and they have received little or no compensation for their losses. The Ugandan constitution provides for the protection of the rights of minorities, yet the situation that the Batwa are living in clearly indicates that their rights are being systematically violated. For example they not only lack access to the health services offered to other Ugandans by the government but also lack access to clean water, shelter, and food. Not surprisingly, the Batwa have a high HIV prevalence but access to antiretroviral (ARV) treatment for the Batwa is very hard. Not only do they have to walk for five kilometres (a long distance if you are terminally ill) and more to access them, but even when they reach the health centres, they are often segregated against by everyone, including the health care providers. Accurate figures are difficult to determine and estimates vary, but the 2015 housing and population census showed that approximately 6,700 Batwa lived within the state of Uganda. They are mainly found in the south-west region in the districts of Kisoro, Kanungu, Kabale, Mbarara, Ntungamo and Lwengo (Katovu township). Not only is the discrimination institutional, it also extends to the social and quotidian. The Batwa are seen as backward and childish, incapable of speaking or representing themselves (the only minority group not represented in parliament). They are presumed to be thieves and are considered dirty, ignorant and immoral. Often they are not allowed to draw water from a communal well, and intermarriage with other ethnic groups is frowned upon. Faced with all these prejudices, the formation of a Batwa advocacy group was long overdue. So In 2000, the Batwa formed United Organisation for Batwa Development in Uganda (UOBDU), an organisation which has mainly fought the dispossession of the Batwa from their ancestral land. After the park creation in 1991, 82 percent of Batwa were left entirely landless, living either as squatters on private, government or church land. In 2004, 44 percent of Batwa had no land on which to build a hut. Data collected in 2007 by UOBDU show that the landless in Kisoro represent 50.4 percent, in Kabale 61.4 percent, in Kanungu 20.9 percent, while all of the households in Mbarara, Katovu and Ntungamo are landless. The organisation has argued in the courts that the land for the national parks was unlawfully seized from the indigenous people, but the case is yet to be resolved. Through UOBDU, the Batwa are fighting to secure land rights, the right to education and literacy, sustainable livelihoods, improved healthcare, and institutional development, says Elias Habyar’imana, the Chairperson of the Kisoro based NGO. To supplement all these efforts, their plight received international attention in 2014, when the Oscar-nominated documentary Virunga came out, exposing the existential threat they face. On February 8, 2013, the Batwa of Uganda submitted a petition to the Constitutional Court of Uganda seeking recognition of their status as indigenous peoples under international law and redress for the historic marginalisation, dispossession and the human rights violations perpetrated against them. As I write this, the petition to the Constitutional Court of Uganda involving the Attorney General, the National Forest Authority and the Uganda Wildlife Authority (UWA) is yet to be heard in court. The central issue for the Batwa is their land. To date, the revenues and employment opportunities arising from governmental exploitation of protected areas have not benefited the Batwa. Revenues generated from activities now taking place on the Batwa’s ancestral lands should go into a public purse. However, the Batwa have not seen any of these revenues. While the courts drag their feet, the Batwa communities continue to suffer violence and discrimination from neighbouring ethnic groups. On Sunday 7th June 2014, Batwa communities in Ryabitukuru, Kisoro District, had their homes burned. Out of the 14 households in the community, 13 were targeted, leaving many families destitute and homeless. The Batwa households are scattered over a large area of land, yet it took the violent mob only two hours to move from house to house. Fearing for their lives, the Batwa fled to the Rubuguri Police Post for security. Because the post was small, the Batwa were shifted from there to an NGO building. It is from there that well wishers, including NGOs like UOBDU and Red Cross, have provided them with food, water, utensils, blankets and other amenities. The Batwa are seen as shy, loyal to the traditional practices which define them as a forest people. Their Practices include hunting and gathering forest resources, eating uncooked food, worshipping gods in the forest, sleeping in caves, guiding forest researchers and tourists, dressing in leaves and animal skins, making fire using dry sticks. Caves, hot springs, rivers, hills, plants and animals are of special significance in their worldview. The forests are a source of physical, emotional and spiritual well-being and before they were gazetted as national parks, the Batwa depended on forest resources for food, medicine, basketry, firewood, marketable items, house construction, tools, rituals, hunting and recreation. “When they chased us from the forest, we started living here in Rushaga. We would go back to the forest to look for meat, honey, wild yams, firewood, weaving materials and medicinal plants. But later, we were told to stop going back to the forest. Many of our people died. We tried hard to survive in the challenging village conditions by begging for food from Bakiga,” she spoke in her mother tongue as George Wilson Mpakasihe translated. Traditionally, the Batwa had three main types of houses: caves, omuririmbo and ichuro. The caves and omuririmbo were the main houses where Batwa lived. Ichuro was used for resting and storing food including meat, honey, beans and sorghum, all of which in makeshift grass thatched round huts that can accommodate about five people at a time. The Batwa also had a special way of burying the dead. When a Mutwa died, he or she would be buried in a hut after digging a small hole and wrapping the corpse in grass. The burial ceremony involved cleansing the corpse with herbs such as omuhanga (Maesa lanceolata), enkyerere (Rubus sp. ), and omufumba (Rhumex sp). The Batwa elders would lead the burial ceremony and encourage all the family members to drink herbal extracts as a way of preventing death from claiming more people from that family. After burial, they would migrate to a far off place and never return. According to Batwa customs, a Mutwa cannot marry a non-Mutwa and getting pregnant before marriage was forbidden. Marriage was arranged by the parents. The parents of a Mutwa boy would admire qualities in a certain Mutwa girl and decide that she was the right partner for their son. They would then visit the girl’s family carrying gifts which included pots of honey from stingless bees, beer brewed with honey and roast meat. During the visit, they would negotiate the dowry to be paid to the girl’s family and the date for the ‘give-away’ ceremony. On the day of ‘giving away’ the girl, the groom would bring many gifts for the bride and her family. Such gifts included beads, new and well-oiled animal skins, roast meat, elephant tusks, honey from stingless bees, beer brewed with honey and sometimes hunting dogs. The groom would take the bride to his home and then live together while receiving advice from the groom’s parents. After some time, the young family would later migrate to a distant place to establish their new and independent home. When the woman became pregnant, she would be fed on meat, honey and vegetables and would drink many kinds of herbs for boosting her health and that of the unborn baby. At the time of giving birth, she would be helped by other women who would use pieces of bamboo to cut the umbilical cord. The baby would be wrapped in clean animal skins and brought near a fire place for warmth. This way of living is under threat or has already vanished. The Uganda Wildlife Authority continues to make millions from tourism annually on their land. For three decades, the Batwa have been struggling to have their rights recognised. The legal case is unlikely to succeed, so the Batwa remain stuck in a legal limbo with unpromising prospects.